The Engage Lead Serve Board 's Green Initiatives committee and Mental and Physical Health committee are teaming up to organize a Sustainability Retreat to teach students how to be sustainable for both the earth and themselves mentally and physically. 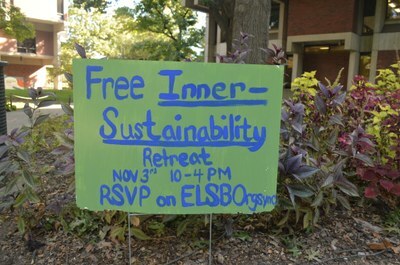 RSVP for this FREE half-day Inner-Sustainability Retreat on UofL's campus. Explore how well-being and your environment intertwine in our understanding of self. Get the tools you need to help sustain yourself and your surroundings into the future. Open to anyone and everyone. If you have any questions, concerns or accommodation needs please contact henny.ransdell@uoflelsb.org.